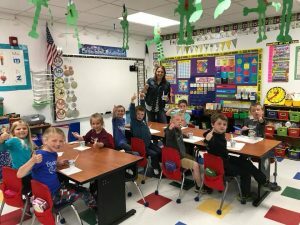 Dairy Ambassador visit St. Paul Lutheran Church and School and Luxemburg- Casco schools in April and May to spread their dairy cheer! 3rd-8th graders were visited by FFA members, Kim Van Donsel & Gabrielle Haen. 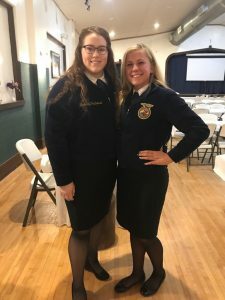 Kim & Gabrielle shared how FFA has impacted their personal and academic lives. They also discussed the varied interests, scholarships, and networking opportunities that FFA offers, ending the visit with a fun training of sheep judging. Their treats included string cheese, a glass of chocolate milk, & a sub sandwich, which represents all forms of agriculture. A Special thank you to Kim & Gabrielle for sharing their experience with our youth! The 4K class was visited by Catrina Thiry, who read the book “A Fairy in the Dairy”. The kids developed their own ice cream flavor & gave it a creative name. Afterwards, everyone enjoyed a traditional ice cream sundae with a cherry on top. The 5K class was visited by Stacy Jauquet, who read the book, “A Farm of Many Colors”. 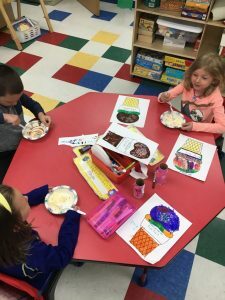 They learned how agriculture comes in all colors of the rainbow & enjoyed a yogurt parfait. Both books are provided by Dairy Farmers of Wisconsin. 1st/2nd graders learned about Curd Science. Each student received a book provided by the Dairy Farmers of Wisconsin & watched a short video about how cheese is made. They made butter in class & tried 3 different cheeses, Cheese Curds, Medium Cheddar, and Sharp Cheddar. These cheese demonstrate how cheese can be cured for many years before consumers can find it in the grocery store. 3rd graders from Luxemburg-Casco. Catrina Thiry assisted Stacy Jauquet in sharing the Build a Better Body Program, which focuses on building a plate of colorful foods to eat from each of the five food groups. Then the kids played games, concentrating on colorful food options, food groups, and healthy snacks. The day ended with building a kabob stick full of protein, dairy, fruits, vegetables, and grain. 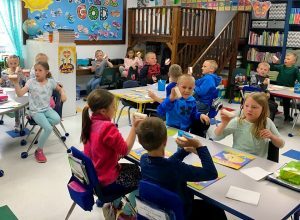 2nd graders at the Luxemburg-Casco Primary School in April. The topic was Curd Science & each student was given a book provided by the Dairy Farmers of Wisconsin. The kids watched a short video about how cheese is made & then made their own butter in class. Each student sampled Cheese Curds, Medium Cheddar, & Sharp Cheddar to learn how cheese can be cured for many years before consumers purchase it in the store. The best part, the class danced to the “Moo Cow” song, because exercising is just as important as eating Dairy! Thank you Catrina & Stacy for your dedication to connecting the community to the dairy industry!